The MG 42 (shortened from German: Maschinengewehr 42, or "machine gun 42") is a 7.92×57mm Mauser general-purpose machine gun designed in Nazi Germany and used extensively by the Wehrmacht and the Waffen-SS during the second half of World War II. It was intended to replace the earlier MG 34, which was more expensive and took much longer to produce, but both weapons were produced until the end of the war. MG 42 with retracted bipod. Designed to be low-cost and easy to build, the MG 42 proved to be highly reliable and easy to operate. It is most notable for its very high cyclic rate for a gun using full power service cartridges, averaging about 1,200 rounds per minute compared to around 850 for the MG 34, and perhaps 450 to 600 for other common machine guns like the M1919 Browning or Bren. This ability made it extremely effective in providing suppressive fire, and its unique sound led to it being nicknamed "Hitler's buzzsaw". The MG 42 was adopted by several armed organizations after the war, and was both copied and built under licence. The MG 42's lineage continued past Nazi Germany's defeat, forming the basis for the nearly identical MG1 (MG 42/59), chambered in 7.62×51mm NATO, which subsequently evolved into the MG1A3, and later the Bundeswehr's MG 3 and Italian MG 42/59. It also spawned the Yugoslav nearly identical Zastava M53, Swiss MG 51 and SIG MG 710-3, Austrian MG 74, and the Spanish 5.56×45mm NATO Ameli light machine gun, and lent many design elements to the American M60 and Belgian MAG. Even before World War I, the German military was already looking forward to replacing the heavy machine guns which proved to be such a success in that war. The MG13 was one of the first developments toward a goal of producing a weapon that could perform multiple roles, rather than just one. The MG13 was the result of reengineering the Dreyse Water cooled machine gun to fit the new requirement. The twin barreled Gast gun was developed with the goal of providing a high cyclic rate of fire weapon for anti-aircraft use which was reported to have reached cyclic rates of fire as high as 1,600 rounds per minute. This eventually led to the Einheitsmaschinengewehr (Universal machine gun) introducing an entirely new concept in automatic firepower. By changing its mount, sights and feed mechanism, the operator could radically transform an Einheitsmaschinengewehr for several purposes. The MG 34 is considered to be the first modern general-purpose machine gun or Einheitsmaschinengewehr. It was developed to use the standard German 7.92×57mm Mauser full-power rifle round. It was envisaged and well developed to provide portable light and medium machine gun infantry cover, anti-aircraft coverage, and even sniping ability. Equipped with a quick-change barrel and fed either with non-disintegrating metallic-link belts, or from a 50-round Gurttrommel (belt drum) or a 75-round spring-loaded saddle-drum Patronentrommel 34 magazines (with a simple change of the feed cover for a Trommelhalter magazine holder), the MG 34 could sustain fire for much longer periods of time than other portable squad-level weapons such as the American B.A.R. and the British Bren Gun, both of which were fed by box magazines, while also being much lighter and more portable than crew-served weapons like the Browning M1919 or Vickers machine guns (which also lacked quick-change barrels). The MG 34 was also quite versatile; not only was it able to be fed from belted ammunition or a saddle drum magazine, it could also be fired from a bipod, an innovative Lafette 34 tripod or various pintle mounts for armored vehicles. Switching between a bipod and a tripod required no special tools, as the mounting latch was spring-loaded. As the MG 34 Panzerlauf, it was used throughout the war as secondary armament on panzers and other vehicles. One attempt at improvement was the MG 34S, an incremental improvement on the basic 34 design. The MG 34S could cope with a cyclic fire rate of 1,200 rounds per minute. Later in the war, the MG 34 was used as the basis for the Luftwaffe's MG 81 flexible defensive gun that had a cyclic fire rate of 1,200-1,6000 rounds per minute. However, the MG 34 did have its drawbacks, such as sensitivity to dirt and mud, and comparatively complex and expensive production. A German Waffen SS soldier involved in heavy fighting in and around the French town of Caen in mid-1944. 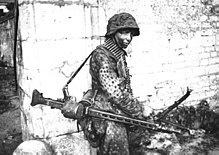 He is carrying an MG 42 configured as a light support weapon with a folding bipod and detachable 50-round belt drum container. In order to address these issues, a contest was held for a true MG 34 replacement. Three companies were asked to submit designs: Metall und Lackierwarenfabrik Johannes Großfuß AG of Döbeln, Rheinmetall-Borsig of Sömmerda, and Stübgen of Erfurt. Of the number of proposals submitted, Großfuß AG's proved to be the best design by far, employing a unique recoil-operated roller locking mechanism whereas the two competing designs used a gas-actuated system. The company had no earlier experience in weapons manufacture, specializing in pressed and stamped steel components (the company's staple product was sheet metal lanterns). Dr.-Ing. Werner Gruner, one of the leading design engineers with Großfuß, knew nothing about machine guns when he was given the task of being involved with the project, although he specialized in the technology of mass production. Gruner would attend an army machine gunner's course to familiarize himself with the utility and characteristics of such a weapon, also seeking input from soldiers. He then recycled an existing Mauser-developed operating system and incorporated features from his experiences with army machine gunners and lessons learned during the early stages of the war. Being made largely out of stamped appropriately hardened metal, the new design required considerably less machining and fewer high grade steel alloys. It was much simpler to build than other machine guns—it took 75 man hours to complete the new gun as opposed to 150 man hours for the MG 34 (a 50% reduction)—and cost 250 RM as opposed to 327 RM (a 24% reduction). The resulting MG 39 remained similar to the earlier MG 34 overall, a deliberate decision made to maintain familiarity. The only major changes from the gunner's perspective were dropping of the drum-magazine feed option, leaving the weapon to fire belted ammunition, or from a single 50-round drum-shaped Gurttrommel belt container fitted to the gun's receiver, and simplifying the weapon's open sights for aiming purposes. All these changes were intended to increase, maintain, or accommodate the gun's high practical rate of fire. Although made of relatively inexpensive and simple parts, the prototypes also proved to be considerably more rugged and resistant to jamming than the precisely machined and somewhat temperamental MG 34. A limited run of about 1,500 of its immediate predecessor, the MG 39/41, was completed in 1941 and tested in combat trials. The weapon was officially accepted, and the main manufacturing of the production design began in 1942, as the MG 42, contracts going to Großfuß, Mauser-Werke, Gustloff-Werke and others. Production during the war amounted to over 400,000 units (17,915 units in 1942, 116,725 in 1943, 211,806 in 1944, and 61,877 in 1945). 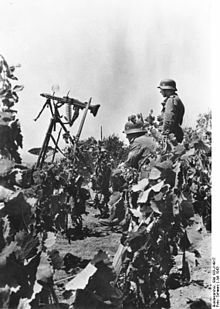 The distinctive sound caused by the high cyclic firing rate gave rise to the nickname "Hitler's buzzsaw" and the German soldiers' Hitlersäge, Singende Säge, Knochensäge or elektrisches MG ("Hitler's saw", "Singing saw", "Bone saw" or "electric machine gun"). 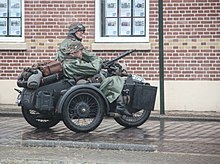 The gun (like the MG 34) was sometimes called "Spandau" by British troops, a traditional generic term for all German machine guns, left over from the famous Allied nickname for the MG 08 Maxim-derivative used by German forces during World War I and derived from its manufacturer's plates noting the city of Spandau where some were produced. Brazilian expeditionary soldiers fighting in Italy used to refer to MG 42 as Lourdinha; this nickname is due to the fact that the bride of one of the soldiers, named Maria de Lourdes, was a seamstress and the sound of MG 42 was similar to the sound of her sewing machine (Lourdinha is a common nickname in Brazil for women called Maria de Lourdes). The German tactical doctrine of the era based a squad's firepower on the general-purpose machine gun in the light machine gun role so that the role of the rifleman was largely to carry ammunition and provide covering fire for the machine gunners. The advantage of the general purpose machine gun concept was that it added greatly to the overall volume of fire that could be put out by a squad-sized unit. This meant that German forces deployed far more machine guns per equivalent-sized unit than the Allies, and that Allied troops assaulting a German position almost invariably faced the firepower of the MG 42. It was possible for operating crews to lay down a non-stop barrage of fire, pausing only when the barrel had to be replaced. This allowed the MG 42 to tie up significantly larger numbers of enemy troops. The Americans and the British trained their troops to take cover from the fire of an MG 42, and assault the position during the small time window of barrel replacement, which took around 4 to 7 seconds (estimated). The German military kept issuing Karabiner 98k bolt-action rifles and did experiment with semi-automatic rifles throughout World War II. They fielded the Gewehr 41 series of which fewer than 150,000 were built, and the Gewehr 43/Karabiner 43 series of which 402,713 were built. They introduced the first assault rifle in 1943 – the MP43 / MP44 / StG 44 series, of which 425,977 were built. Due to the relatively limited production of semi-automatic and assault rifles, the Karabiner 98k of which over 14,600,000 were built remained the primary service weapon until the last days of World War II, and was manufactured until the surrender in May 1945. The Allied nations squad tactical doctrines of World War II centered on the rifleman, with the machine gun serving a support role, and they utilised weapons with cyclic fire rates of typically 450–600 rounds per minute. The American military had standardized a semi-automatic rifle in 1936 (the M1 Garand) that could be effectively fired more rapidly than the preceding bolt-action rifles. The Allied nations had machine guns with similar rates of fire, but mounted them almost exclusively in aircraft, where the fleeting opportunities for firing made such high rates necessary. The only similar Allied weapon was the Vickers K aircraft gun, and that was used by ground forces only in specialized circumstances. A German infantry Gruppe (squad) consisted of ten men; a non-commissioned officer or Unteroffizier squad leader, deputy squad leader, a three-man machine gun team (machine gunner, assistant gunner/loader and ammunition carrier) and five riflemen. As personal small arms the squad leader was issued a rifle or as of around 1941 a submachine gun, the machine gunner and his assistant were issued pistols and the deputy squad leader, ammunition carrier and the riflemen were issued rifles. The riflemen carried additional ammunition, hand grenades, explosive charges or a machine gun tripod as required and provided security and covering fire for the machine gun team. Two of the standard issue bolt-action Karabiner 98k rifles in the squad could be replaced with semi-automatic Gewehr 43 rifles and occasionally, StG-44 assault rifles could be used to re-arm the whole squad, besides the machine-gun. The optimum operating crew of an MG 42 in its medium machine gun role was six men: the squad leader, the machine gunner who carried and fired the gun, the assistant gunner/loader who carried the tripod, and three riflemen who carried ammunition, spare barrels, entrenching tools, and other items. One of the Einheitsmaschinengewehr (Universal machine gun) roles was to provide low level anti-aircraft coverage. A high cyclic rate of fire firing rate is advantageous for use against targets that are exposed to a general-purpose machine gun for a limited time span, like aircraft or targets that minimize their exposure time by quickly moving from cover to cover. For targets that can be fired on by a general-purpose machine gun for longer periods than just a few seconds the cyclic firing rate becomes less important. As a consequence one of the MG 42 most notable features was in its high cyclic rate of fire of about 1,200 to 1,500 rounds per minute, twice the rate of the Vickers and Browning machine guns, which fired at a rate of about 600 rounds per minute. The ear could not easily discern the sound of individual shots being fired, instead hearing a sound described as like "ripping cloth" or a buzzsaw. The high cyclic rate of fire of the MG 42 sometimes proved a liability mainly in that, while the weapon could be used to devastating effect, it could quickly exhaust its ammunition supply. For this reason, it was not uncommon for all soldiers operating near an MG 42 to carry extra ammunition, thus providing the MG 42 with a backup source when its main supply was exhausted. Another disadvantage of the MG 42 was that the high cyclic rate of fire led to the barrel overheating quickly during rapid fire. After around 150 rounds of rapid fire, the gun operator would open a side hatch (leading to the barrel) and replace the hot barrel with a new cool(er) one. Non-observance of this technical limitation renders the barrel prematurely unusable. The machine gun crew member responsible for a hot barrel change was issued protective asbestos gloves to prevent getting burned. The German military instructed that sustained fire must be avoided at all costs. They ruled that the results of sustained fire were disappointing and that the expenditure of ammunition involved was "intolerable." In the bipod-mounted light machine gun role MG 42 users were trained to fire short bursts of 3 to 7 rounds and strive to optimize their aim between bursts fired in succession. For its medium machine gun role the MG 42 was matched to the newly developed Lafette 42 tripod. In the tripod mounted medium machine gun role MG 42 users were trained to fire short bursts and bursts of 20 to 50 rounds and strive to optimize their aim between bursts fired in succession. As a consequence of factors like the time spent reloading, aiming, changing hot barrels if necessary to allow for cooling, the MG 42's practical effective rate of fire was 154 rounds per minute, versus 150 rounds per minute for the MG 34. The MG 42 is a 7.92×57mm Mauser, air-cooled, belt fed, open bolt, recoil-operated machine gun with a quick change barrel. The MG 42 weighed 11.57 kg in the light machine gun role with the bipod, lighter than the MG 34 and easily portable. The bipod, the same one used on the MG 34, could be mounted to the front or the center of the gun depending on how and where it was being used. The roller-locked recoil operation functions as follows: two cylindrical rollers, positioned in tracks on the bolt head, are pushed outwards into matching tracks in the barrel extension by the striker sleeve and lock the bolt in place against the breech. Upon firing, rearward force from the recoil of the cartridge ignition pushes the striker assembly back and allows the rollers to move inwards, back to their previous position, unlocking the bolt head and allowing the bolt assembly to recoil, extracting the spent cartridge and ejecting it down. The return spring then pushes the bolt assembly forwards again, pushing a new cartridge out of the belt into the breech, and the sequence repeats as long as the trigger is depressed. The MG 42 is capable only of fully automatic fire. Single shots are difficult, even for experienced operators, due to the weapon's rate of fire. The usual training objective is to be able to fire a burst of no more than three rounds. The weapon features a recoil booster at the muzzle to increase rearwards force due to recoil, therefore improving functional reliability and rate of fire. The cyclic firing rate of the MG 42 can be altered by installing different bolts and recoil springs. A heavier bolt uses more recoil energy to overcome inertia, thus slowing the cyclic rate of the machine gun. Heavy bolts also were used along with stiffer return springs. 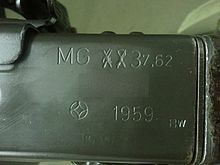 The standard MG 42 bolt weight for a normal rate of fire is 550 g (19.40 oz). The shoulder stock is designed to permit gripping with the left hand to hold it secure against the shoulder. The open-type iron sighting line has a relatively short 430 millimeters (16.9 in) radius and consists of a "∧-type" height adjustable front sight on a folding post and a leaf rear sight with an open V-notch sliding on a ramp, graduated from 200 to 2,000 meters (219 to 2,187 yd) in 100 meters (109 yd) increments. An auxiliary anti-aircraft "spider web" ring sight is kept in the maintenance kit, that can be fitting on the barrel jacket to be used in conjunction with a folding anti-aircraft rear peep sight that is attached by a hinge to the rear sight element base. The 530 millimeters (20.9 in) long barrel of the MG 42 could be quickly changed by the machine gun crew and weighed 1.75 kg (3.9 lb) including the locking piece. The barrels could have traditional rifling or polygonal rifling. Polygonal rifling was an outgrowth of a cold-hammer forging process developed by German engineers before World War II. The process addressed the need to produce more durable machine gun barrels in less time than those produced with traditional methods. Later produced barrel bores featured hard-chrome plating to make them more durable. 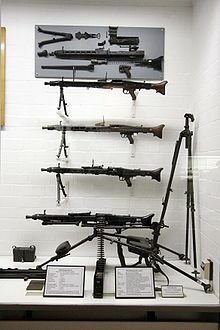 The different versions meant that the service life of an MG 42 barrel varied between 3,500 and 8,000 rounds assuming the barrel was used according to regulation that prohibited rapid firing over 150 rounds. Excessive overheating caused by rapid firing about 500 rounds through a barrel resulted in unacceptable wear of the bore rendering the barrel useless. The method of barrel change made the MG 42 unsuitable for secondary or co-axial armament on World War II era German tanks with the exception of the Jagdpanzer IV. Early versions of the Jagdpanzer IV carried two standard (no modification made) MG 42s on both sides of the gun mantlet/glacis, firing through a ball slot which was protected by an armored cover (with the MG 42 retracted) when not in use. Later version Jagdpanzer IVs carried only one MG 42 on the left side. The MG 42 incorporated lessons hard-won on the Eastern Front. Both the cocking handle and the catch for the top cover to the working parts were designed so that the gunner could operate them wearing arctic mittens or with a stick or rod. This was vital for winter conditions where contact by bare flesh on cold metal could cause severe injury, such as instant frostbite. The MG 42 also functioned well in other climates; dust and dirt in North Africa and Italy was less likely to jam the MG 42 than the more temperamental MG 34. The MG 42 belt-feed mechanism was copied and used in the design of the M60 machine gun. The trigger mechanism of the FN MAG or MAG-58 is a virtual copy of the MG 42's and the MAG-58's belt-feed is also very similar. For the medium machine gun role a large tripod, the Lafette 42, was available that included a number of features, such as recoil absorbing buffer springs, MG Z 34 or MG Z 40 periscope-type telescopic sight containing special sighting equipment for indirect fire, or the late World War II MG Z 44, designed for direct fire only. An accessory to lengthen these sights' periscope was available to use these sights behind cover. It could be set up in a prone, kneeling or high position. The Lafette 42 weighed 20.5 kg (45.2 lb) on its own and was a simplified version of the Lafette 34 used for the MG 34, as the MG 42 could be operated more easily from a Lafette and featured no semi-automatic firing mode. The legs could be extended with a Lafetteaufsatzstück to allow it to be used in the anti-aircraft role, and when lowered, it could be placed to allow the gun to be fired "remotely" while it swept an arc in front of the mounting with fire. Mounted to the Lafette and aimed through the telescopic sight, the effective range of the MG 42 could be extended out to 3,500 m (3,828 yd) when fired indirectly. The Lafette 42 tripod also had a bolt box to store a (spare) bolt and return spring. Another unique feature of German World War II machine guns was the Tiefenfeuerautomat feature on the Lafette 42 tripod. If selected, this feature mechanically controlled the rise and fall of the gun, elevating the gun for five rounds and then depressing it for four rounds. It lengthened the beaten zone by walking the fire in wave like motions up and down the range in a predefined area. The length of the beaten zone could be set on the Tiefenfeuerautomat. E.g., being unsure whether the real distance was 2,000 or 2,300 m (2,187 or 2,515 yd), the gunner could make the mount do an automatic sweep between the elevations for 1,900 to 2,400 m (2,078 to 2,625 yd) and back. This sweeping of a selected beaten zone continued as long as the gun fired. The Lafette 42 had a Richt- und Überschießtafel (Overhead firing table) riveted to the rear body of the searchfire mechanism from the very start of production until the very end of it. In the later stages of World War II ballistic correction directions were added for overshooting friendly forces with S.m.E. - Spitzgeschoß mit Eisenkern (spitzer with iron core) ammunition of which the external ballistic behaviour started to significantly deviate from 1,500 m (1,640 yd) upwards compared to the s.S. Patrone (s.S. ball cartridge). Finland acquired 5 MG 42s in July 1943 for evaluation. Three were tested with front units. Finland decided to produce 4,000 MG 42s modified to fire 7.62×54mmR cartridges but only one modified prototype was ever made. In 1944, the material shortages of the Third Reich led to the development of a newer version, the MG 45 (or MG 42V), which had a different operation mechanism that used roller-delayed blowback as opposed to roller locking. For this reason, the MG 45 is considered a different type of firearm, as the mechanisms of these two guns are different. It used steel of lesser quality, which reduced weight to 9 kg, while retaining the horizontal cocking handle. First tests were undertaken in June 1944, but development dragged on and eventually only ten were built. The tested MG 45/42V fired 120,000 rounds in succession at a cyclic rate of fire around 1,350 rounds per minute. The MG 42V had some influence in the post-war development of roller-delayed blowback system, as employed in issued CETME, SIG and Heckler & Koch small arms. The T24 machine gun was a prototype reverse engineered copy of the German MG 42 general-purpose machine gun developed during World War II as a possible replacement for the Browning Automatic Rifle and M1919A4 for infantry squads. The T24 was chambered for the .30-06 Springfield cartridge. By February 1943, US ordnance authorities published the first report on the MG 42, following testing of a captured gun. The quick barrel changing and belt feed systems were considered some of the best design features. The US Army wanted to be able to manufacture this general-purpose gun because it was technically advanced and much easier to make than the World War II US light and medium machine guns and it was decided to convert several MG 42s to fire .30-06 Springfield M2 ball ammunition. Saginaw Steering Gear Division of General Motors received a contract to construct two working converted MG 42 prototypes designated as the T24 machine gun. It could also be used on an M2 Tripod. The gun was made as an almost exact copy of the MG 42 which was chambered in 7.92×57mm Mauser. Some engineering changes were to use a barrel chambered for the .30-06 Springfield service round and an extremely increased weight 47 oz (1,332 g) bolt and stiffer return spring in an effort to reduce the cyclic rate consistent with US rate requirements. Saginaw Steering Gear did not dimensionally adjust the prototypes for the dimensionally 6.35 mm (0.25 in) longer .30-06 Springfield (7.62×63mm) cartridge case. When one of the two T24 machine gun prototypes was fired at Aberdeen Proving Ground, it fired only one shot and failed to eject the cartridge. A second attempt had the same result. The other prototype was plagued with excessive ejection failures and to a lesser extent failures to feed. The average cyclic rate of fire of the tested weapon was 614 rounds per minute. During January to February 1944 Aberdeen Proving Ground tests unsatisfactory functioning led to substitutions and changes of various parts in an effort to place the weapon in a position to continue the test, but all efforts failed. Firings were discontinued in February 1944 after 51 malfunctions and firing a total of 1,583 rounds by authorization of Major C. Balleisen, O.C.O. when it became evident the weapon required further development. In March 1944 the US military concluded that functioning of the T24 machine gun prototype was unsatisfactory and recommended that further development was required before this weapon be subjected to the lengthy and severe standard light machine gun test. However, the realization that the .30-06 Springfield cartridge was too long for the prototype gun's mechanism to easily and reliably work with resulted in the discarding of the project. Saginaw Steering Gear did not get the opportunity to correct the flaws that caused the inability to obtain reliable uninterrupted automatic functioning and ready the weapon for mass production before World War II ended. The Swiss MG 51 or 7.5 mm Maschinengewehr 1951 was based on the design of the MG 42 chambered for 7.5×55mm Swiss GP 11. The final design, which appeared in 1950, was in most respects still similar to the MG 42, although many components were produced by machining instead of stamping, which increased the weight, the stability and the production costs of the machine gun. To prevent short shots Waffenfabrik Bern changed the locking system from roller to flapper locking. The resulting weapon had a cyclic rate of fire of 1,000 rounds per minute, was in the light machine gun role 4.4 kg (9.70 lb) heavier than the German MG 42, and much more finely made and finished. Yugoslavian built Zastava M53, a near exact copy of the MG 42. Note that the example in the photo is missing the trigger group. In Yugoslavia this MG 42 variant was built at the state-owned Zavodi Crvena Zastava company as the M53 machine gun using original German machinery, retaining the 7.92×57mm Mauser chambering. By doing so, the Yugoslavs retained the original weapon's design features, making the M53 a near exact copy of the German MG 42. The only major differences were a slower 950 rounds per minute cyclic rate of fire and no anti-aircraft sight mount. The aiming range of the M53 is 2,000 m (2,187 yd), and the terminal range of the bullet is 5,000 m (5,468 yd), the same as the MG 42. MG 42s captured in Yugoslavia at the end of World War II were put into reserve of Yugoslav People's Army as M53/42s. The last military use of M53s in Yugoslavia was in 1999. Some quantities of M53s were exported to Iraq in the 1980s and saw extensive action during both Gulf wars. M53 was known under the nickname Шарац (Šarac). At the end of World War II the original technical drawings and data for the MG 42 were captured by the Soviets. These would eventually find their way to Czechoslovakia and Yugoslavia. The MG3 (originally the MG 1 launched in 1958) is the MG 42 design rechambered to 7.62×51mm NATO. It is the primary general-purpose machine gun of the modern German armed forces (Bundeswehr). A number of other (NATO) armies around the world have adopted the MG3, and it remains in widespread service today. The MG 3 and its preceding variants all share a high level of parts interchangeability with the original MG 42. Like the MG 42, the MG3 cyclic rates of fire can be altered by exchanging the standard weight (about 650 g (22.93 oz)) bolt used for the standard 1,100–1,200 rounds per minute rate of fire for an extra weight (about 900 g (31.75 oz)) bolt for a reduced 800–950 rounds per minute rate of fire. It must be noted that those bolts also are used along with different recoil springs. The Italian MG 42/59 licensed MG 3 variant produced by Beretta, Whitehead Motofides and Franchi since 1959, features an extremely heavy 1,200 g (42.33 oz)) bolt which reduces the cyclic rate of fire to around 800 rounds per minute. The final variant to date is the MG 74, developed by Austria and since 1974 it is the standard machine gun of the Austrian Armed Forces. After its founding in 1955, the Austrian army was equipped with old guns temporarily out of U.S. stocks. Starting in 1959 these Browning M1919 were largely replaced by the MG 42 with modified barrel and bolt for the new 7.62×51mm NATO. But to introduce a modern weapon of its own production the Office of Defence Technology, in cooperation with Steyr Mannlicher and Beretta developed a gun specifically for the Austrian Army. The German MG 42/59 that was introduced in 1959 with the Bundeswehr to replace the U.S. machine guns, served as the basis, which was similar to the Austrian 7.62 mm MG 42. Targets were to reduce, among other things, the cyclic rate of fire and weight and have more versatile sights and mount. The development of the weapon was completed in 1974. It replaced from this year the MG 42 as the MG 74 of the Austrian Federal Army. The modifications to the basic MG 42 design include an extremely heavy bolt (950 g (33.51 oz) vs. the 675 g (23.81 oz) MG 3 bolt) which reduces the cyclic rate of fire to around 850 rounds per minute. Rate of fire can be varied, if necessary, by changing the bolt and recoil spring. In addition, a select fire trigger group was added to allow semi-automatic fire (single shot) compared to the traditional fully automatic only fire capability of the original MG 42 design. The MG 74 also has a modern polymer stock and handgrips to save weight. Usually colored a dark green, adjustable rear sight (35° horizontal, vertical 15°) and additional anti-aircraft sight can be mounted optional. The Swiss SIG MG 710-3 general-purpose machine gun was based on the design of the MG42V/MG45 using a slight modification of the roller-delayed action and chambered for 7.62×51mm NATO. Its cyclic rate of fire is 900 rounds per minute. The first version looks very much like the MG42. The MG 42's belt-feed mechanism was copied and used in the design of the M60 machine gun. The trigger mechanism of the FN MAG or MAG-58 is a virtual copy of the MG 42's and its belt-feed is also very similar. Norway: Used ex-German MG-42s. Two of an intended batch of ten MG 42s were converted in Norway to .30-06 Springfield and designated as MG42F1. The conversion project abruptly ended as most of Norway's stockpile of MG 42s was sold abroad at the same time. Yugoslavia – Produced as M53. ^ a b c d McNab 2012, pp. 72–73. ^ a b c d e f g h i j k German Army (Heer) (3 May 1944). H. Dv. 181/7 Untersuchung und Instandsetzung des Infanteriegerätes, Teil 7: Waffentechnisches Handbuch für MG 42 [Army Manual 181/7 Inspection and Maintenance of Infantry Equipment, Part 7: Weapon-technical Handbook for the MG 42] (in German). p. 7. ^ a b c d e ""German Views on Use of the MG 42" from Intelligence Bulletin, May 1944". lonesentry.com. Retrieved 17 February 2017. Under battle conditions the MG 42 can fire about 22 bursts per minute—that is, about 154 rounds. Under the same conditions, the MG 34 is capable only of about 15 bursts per minute, at a rate of 7 to 10 rounds per burst, totalling about 150 rounds. Thus the MG 42, used as a light machine gun, requires a slightly higher ammunition expenditure. ^ a b c d Smith, Joseph E. (1973). Small Arms of the World (10th ed.). Harrisburg, PA, USA: Stackpole Co.
^ Smith, W.H.B. (1973). Small Arms of the World (10th ed.). Stackpole. pp. 437–442. ^ a b c Willbanks, James: Machine Guns: An Illustrated History of Their Impact, page 115. ABC-CLIO, 2004. ^ Michael Duffy (22 August 2009). "Encyclopedia - Spandau Gun". Firstworldwar.com. Retrieved 8 December 2016. ^ Bernardo, André (18 March 2018). "O soldado que transformou em música uma batalha histórica para o Brasil na 2ª Guerra". BBC News Brasil. ^ "OSPREY. Elite PUBLISHING. World War II Infantry. Tactics. Squad and Platoon. p. 22-23 Dr. Stephen Bull, OSPREY. Elite PUBLISHING" (PDF). murdercube.com. ^ "MG 42 and MG 3 machine gun". World Guns. 27 October 2010. Retrieved 18 February 2017. ^ "Barrels and Bullets: Conventional Versus Polygonal Rifling - Human Events". humanevents.com. ^ a b Military Small Arms of the 20th Century. 7th Edition. by Ian V. Hogg & John S. Weeks. Krause Publications. 2000. page 379. ^ "The Lafette 34 and 42 main index page". www.bergflak.com. ^ "MG34 and MG42 Lafette wartime development part two". www.bergflak.com. ^ a b "WEAPONS FINNISH ARMY ALMOST HAD IN WORLD WAR 2, PART 1: Rifles and Machineguns". jaegerplatoon.net. 21 August 2016. ^ Smith, W.H.B (1973). Small Arms of the World (10th ed.). Stackpole. p. 442. ^ a b Shepherd, Christian (11 April 2015). "Machine Gun 42". Tactical-life.com. Retrieved 8 December 2016. ^ G3 Defence Magazine August 2010. En.calameo.com (2010-08-04). Retrieved on 2010-10-18. ^ "1945–1970 (Zavodi crvena zastava)" (in Serbian). Zastava. Archived from the original on 21 November 2010. Retrieved 10 October 2010. ^ "1945 – 1970 | Zastava-arms". Zastava-arms.rs. Retrieved 8 December 2016. ^ a b "Rheinmetall Machinengewehr 3 - West Germany". historicalfirearms.info. ^ "Rheinmetall MG3 (Maschinengewehr Modell 3) General Purpose Machine Gun (GPMG)". militaryfactory.com. Retrieved 26 February 2017. ^ "MG 42 and MG 3 - Modern Firearms". modernfirearms.net. 27 October 2010. ^ a b de Quesada, Alejandro (2014). MP 38 and MP 40 Submachine Guns. Osprey Publishing. pp. 66–67. ISBN 978-1780963884. ^ "Rearming Austria: WWII weapons". wordpress.com. 14 June 2015. ^ Jowett, Philip (25 May 2001). The Italian Army 1940–45 (3): Italy 1943–45. Men-at-Arms 353. Osprey Publishing. pp. 43–44. ISBN 9781855328662. ^ "StG-44 in Africa after WWII". wordpress.com. 27 September 2015. ^ Renaud, Patrick-Charles (1996). La bataille de Bizerte (Tunisie) 19 au 23 juillet 1961. Histoire et perspectives méditerranéennes. L'Harmattan. p. 195. ISBN 978-2-7384-4286-4. ^ "В Одессе СБУ задержала диверсанта с арсеналом оружия". gordonua.com. ^ "WWII equipment of the Bundesgrenzschutz". wordpress.com. 10 April 2016. ^ McNab 2012, p. 72. ^ Fitzsimmons, Scott (November 2012). "The White Legion Abandons Zaire". Mercenaries in Asymmetric Conflicts. Cambridge University Press. p. 263. doi:10.1017/CBO9781139208727.007. ISBN 9781107026919. McNab, Chris (20 October 2012). MG 34 and MG 42 Machine Guns. Weapon 21. Osprey Publishing. ISBN 9781780960081.